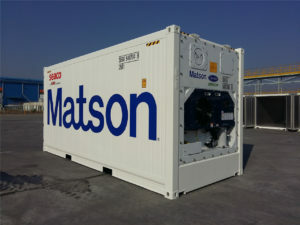 A fleet of 200 newbuild, high-cube refrigerated containers is being deployed by Matson South Pacific. Acquired on a long-term lease, the new boxes will replace old, standard equipment which is being taken out of service, says Matson South Pacific general manager John MacLennan. Matson South Pacific (MSP) is to soon have a new local head, with John MacLennan announcing his second entrance to retirement after leading the fledging division of Matson Navigation over the past four years. “When Matson Navigation purchased Reef from the receivers and established MSP which commenced trading in January 2013, I was asked to come onboard for a six-month contract … four years later I am still here!” quipped Mr MacLennan. Mr MacLennan, who was chief executive of Pacific Forum Line for almost 30 years before having a one-year relief tenure as the head of Reef Shipping, is to be succeeded by current Matson Pacific northwest operations manager Greg Chu. Mr Chu, who is now in the throes of relocating from Seattle to New Zealand, commenced his career with Matson in 2004, with prime responsibility for directing vessel stevedoring, terminal and auto operations as well as co-ordinating container operations for the region. Comments Matson Navigation senior vice-president Vic Angoco: “Greg was SSAT’s vessel operation manager for Terminal 25 at Seattle, which was a dedicated Matson facility and he was instrumental in the move of Matson’s operations from Terminal 25 to Terminal 18 in 2002. Complementing his maritime experience, Mr Chu is a former Lieutenant Commander in the US Naval Reserves, earning a BS in marine transportation from the US Merchant Marine Academy, Kings Point and MBA in business administration from Loyola Marymount University.